COLUMBUS, Ohio -- No one is surprised that Mike Yurcich is a football coach. As a player at Euclid High School, he always had the demeanor and the football IQ of someone who’d one day roam the sidelines. What’s surprising, however, is how quickly he’s risen through the coaching ranks. 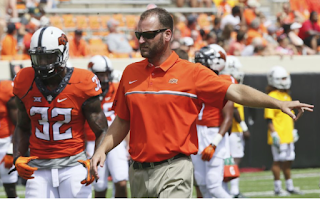 It’s been exactly 20 years since his career began and he’s already built a reputation for coaching record-breaking offenses, most recently at Oklahoma State over the last six years. Now he brings his style to Columbus as Ohio State’s passing-game coordinator under new head coach Ryan Day. He’s found success at the college level much quicker than anyone expected him to -- especially his high school coaches Roy Pignatiello and Tom Banc. Yurcich is a 1994 graduate of Euclid High School, where he was a standout athlete in three sports. He earned seven varsity letters in football, basketball and baseball, but it was on the football field where he was one of the best players in the Greater Cleveland Conference. At 6-foot-1, 170 pounds, he led the Panthers to a 20-3 record in two years as the starting quarterback under Banc. He graduated as the school’s all-time leader in career passing yards (2,209) and touchdowns (22). In 2009, he was inducted into the Euclid High School Sports Hall of Fame. Though Yurcich would continue his playing career at Mount Union College and California (Pa.) University, Banc always knew he would eventually take the path of a coach. Even in high school, Yurcich displayed a football IQ that sometimes outshined his own coaches. He’d often complain that the Panthers didn’t throw the ball nearly as much as they should have. He still feels the same way today. Yurcich’s coaching journey took him first to Division II Edinboro in 2005, where he began to build his reputation for prolific passing attacks. With Yurcich as the Fighting Scots' quarterbacks and wide receivers coach, the offense ranked second in the country and Edinboro made the playoffs in 2009. Edinboro lost in the second round but set a Division II single-game playoff record with 630 passing yards. That game against West Liberty would set records for combined points (147) and yards (1,394) as Edinboro quarterback Trevor Harris -- now playing for Ottawa in the Canadian Football League -- completed 50 of 76 passes with five touchdowns. Less than 15 years later, Yurcich returns to his home state as a key assistant for one of the country’s biggest college football programs. Euclid has developed its fair share of Buckeyes, as well as nine NFL players. Robert Smith, the first player to twice win the Mr. Ohio Football award, is certainly the most famous. Yurcich is the first Panther to have the opportunity to coach in Columbus. Pignatiello admits it will be strange cheering for a coach. More than just wanting him to do well, he hopes that the players Yurcich coaches reach their potential. Pignatiello isn’t surprised. As a quarterback in high school, Yurcich’s role wasn’t much different than that of an experienced NFL quarterback. He was given play options and would choose one based off what he saw at the line of scrimmage. More often than not he’d make the right decision. Day wants a player with an NFL arm and an offensive coordinator unafraid to use it. Pignatiello and Banc once allowed Yurcich to have control over a Euclid offense as a teenager and it led to success. Mike Gundy did the same at Oklahoma State at got historic numbers in the return. Now Day brings him to Columbus hoping for a similar result.